I received two e-mails over the weekend from backyard gardeners in southwest Ohio with pictures showing Black Blister Beetles (Epicauta pennsylvanica) swarming over tomato plants. Blister beetles belong to the family Meloidae with around 2500 species worldwide. 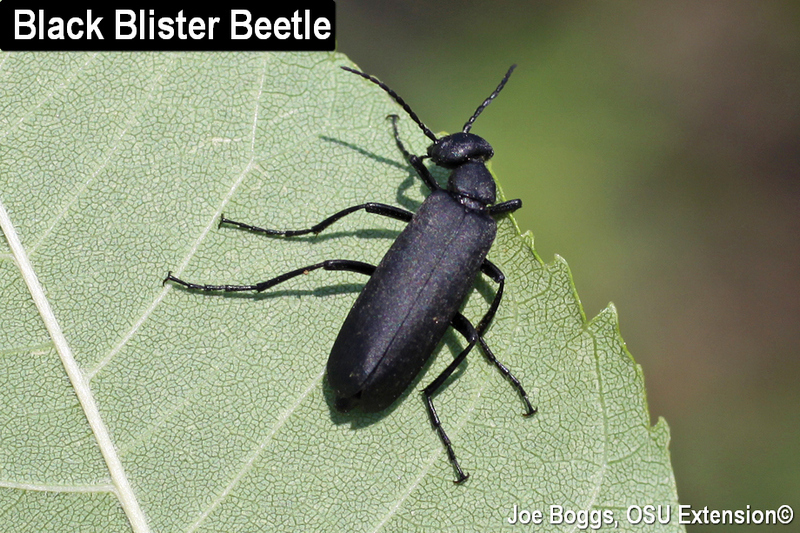 However, black blister beetles as well as Margined Blister Beetles (E. pestifera) are the two most common species found in Ohio. Both beetles are capable of showing-up in large numbers to feed on the leaves and flowers of a wide range of perennials and annuals including vegetable plants. Aside from producing noticeable defoliation, the beetles also pack a serious defensive punch. The beetle's blood contains cantharidin, a chemical that can cause severe skin blistering if the beetles are mishandled, hence the common name. This chemical can also be toxic to people and animals if ingested. Oddly, cantharidin is extracted from a European blister beetle to produce the infamous "Spanish Fly." Blister beetles share a common body plan. The beetles have long legs and narrow, elongated soft bodies. Their heads appear bulbous because they are much wider than the pronotum ("neck"). The beetle's flexible front wings may fail to extend to the tip of the abdomen. Margined blister beetles are so named because the margins of their black wings are bounded by gray edges. Black blister beetles lack markings; they are totally … black. Blister beetle larvae are specialized predators. Some feed on grasshopper eggs while others feed in the nests of solitary bees where they consume bee eggs, larvae, and food stored in the nest. This lifestyle is illustrated by the blister beetle, Lytta aenea, which has no common name. Its larvae have been reared from the cells of the ground-nesting Bicolored Striped-Sweat Bee, Agapostemon virescens. The adults feed on the leaves and flowers of various trees including serviceberry (Amelanchier spp. ), hawthorn (Crataegus spp. ), and apple (Malus spp.). However, they typically cause minimal damage. Adult black and marginal blister beetles may be found consuming leaves or flowers on plants belonging to several families including Amaranthaceae, Asteraceae (= Compositae), Fabaceae (= Leguminosae), and Solanaceae. In fact, I've found it's common for black blister beetles to build high populations on solanaceous weeds, particularly those belonging to the genus Solanum such as horsenettle (S. carolinense) and black nightshade (S. nigrum), then move en masse into vegetable gardens. So, the first line of defense is to manage weeds near vegetable gardens to avoid giving the beetles six-legs up on developing damaging populations. Fortunately, blister beetle visits to vegetable gardens are usually very short lived, lasting only a week or two. They can be controlled if necessary by using an appropriately labeled insecticide. As always, make sure you read and follow label directions paying particular attention to the time between the application and the harvest of vegetables called the "harvest interval." Unfortunately, this may preclude the use of many common insecticides if tomatoes and other targeted vegetable plants have ripened fruit you're planning to harvest. Some online control recommendations include using a gloved hand to knock the blister beetles into a bucket of soapy water. However, the beetles are good flyers and their long legs make them quick movers. Knocking all of the beetles from a heavily infested tomato plant into a bucket is a real challenge and usually ends with a hasty retreat accompanied by a string of expletives and a flying beetle bucket.